The Camino de Santiago from Logroño to Burgos is part of the third section of the French Way. The third section of the French Way runs from Logroño to Burgos. Have an unforgettable experience on the Camino de Santiago from Logroño! Logroño is the capital of the La Rioja region, which is famous for its exquisite wines. In this section we will feel how the level of difficulty decreases with respect to the first and second stages of the French Way. We will get to visit farmlands and vineyards, beautiful medieval castles, spectacular monasteries and unique villages with a special charm. One of the most interesting stops during this section of the French Way is undoubtedly the city of Santo Domingo de la Calzada and its false historical center. This section ends in the beautiful city of Burgos, the birthplace of “El Cid”. Burgos is known for being the Gothic capital of Spain. We will begin section 3 of the French Way in the capital of the La Rioja region, famous for its amazing wines. Before starting section 3 of the French Way we must visit Logroño’s historic center, its cathedral and the city’s churches. We also recommend heading over to Laurel Street and trying some of its delicious tapas. Logroño is also known for its delicious homemade ice creams. Despite being a long route, this section is fairly easy. We will depart from Logroño passing through the ‘Puerta del Camino’ gate. During the first few hours of the day we will be able to see the vineyards of the La Rioja region. The first stop on this route will be in Navarrete, a 12th century town built by the “Knights of the Holy Sepulcher”. In Navarrete we can visit the Baroque Church of La Ascensión. We will continue to Nájera where we will spend the night. Nájera is a medieval city that has historically been connected to the Camino de Santiago. From Nájera we have the chance to get a beautiful panoramic view of the entire region. The third route will be significantly shorter than the previous one and we will get to enjoy incredible views the entire way. Once we leave the town of Nájera, we will make our way along rural paths until reaching the Sierra de la Demanda mountain. Then we will pass through the small town of Azofra. Azofra is dedicated to the patroness of La Rioja; the Virgen of Valvanera. Azofra is also known as the starting point for the “Route of the Monasteries”. The Route of the Monasteries is not actually part of the Camino de Santiago, but it is worth doing if we have a few extra days, especially visiting the monasteries of Yuso and Suso of San Millán de la Cogolla. Finally, we will arrive at Santo Domingo de la Calzada, a beautiful city with a medieval center that historically has been closely tied to the Camino de Santiago. The start of today’s route passes through forests until we reach farmland. As we approach Belorado, we can begin to catch a glimpse of the Oca mountains, these mountains are the last mountain range before reaching the Meseta (plateau). Then we will arrive at Belorado, a small and pleasant town in the province of Burgos. In Belorado we can visit the Church of Santa María where we can see images of Santiago. The walk from Belorado to San Juan de Ortega is a peaceful hike along quiet paths and nature trails. As we get closer to “Villafranca Montes de Oca”, we will start heading into beautiful forests of oak and pine trees. In San Juan de Ortega we have to visit the Mausoleum. The sixth route of section 3 of the French Way takes place on mountainous terrain in the Sierra de Atapuerca mountains, from where we can get excellent views of the entire region of Burgos. We will cross the town of Atapuerca, world famous for its prehistoric caves that have been classified as a World Heritage Site by UNESCO. The first human remains were discovered here in the Atapuerca caves. After beginning our descent, we will reach the outskirts of the city of Burgos, where we can visit one of the most beautiful cathedrals in Spain. In Burgos we can visit the city’s historical center, enjoy a relaxing walk along the river or try some of the local tapas in the old town. Burgos is known in Spain as the country’s Gothic capital. We 100% recommend visiting the Burgos Cathedral. 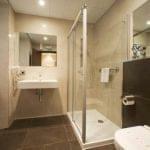 Additional single room: €140 per person. 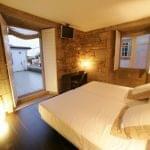 Extra night in Burgos: €55 per person. Transfer from Burgos to Logroño: €140. Travel assistance insurance: €21 per person. Cancellation insurance: €14 per person. Now, we will talk about another section of the Camino Frances. In particular, it is the Camino Frances de Santiago from Logroño to Burgos. This is a highly recommended route for several reasons that we will detail below. That is why if you are thinking of starting your adventure and want to do it with the best possible team, we suggest that you continue reading and encourage you to have an unforgettable experience with Santiago Ways. Why choose the Camino de Santiago from Logroño to Burgos? The Camino de Santiago along the section from Logroño to Burgos is one of the most popular among all possible variants of the Camino de Santiago for several reasons that we want to make clear to you. Either way, it is quite possible that if you dare to try it, you yourself will find new motivations that will make you want to repeat the route. 1.-The places: one of the most powerful reasons to complete the Camino de Santiago from Logroño to Burgos are the wonderful environments that we pass through. These include a wide variety of landscapes and places of special interest to tourists. From the charming Logroño to the imposing city of Burgos, on this route of the Camino Frances de Santiago, everything will help us to live an unforgettable experience. 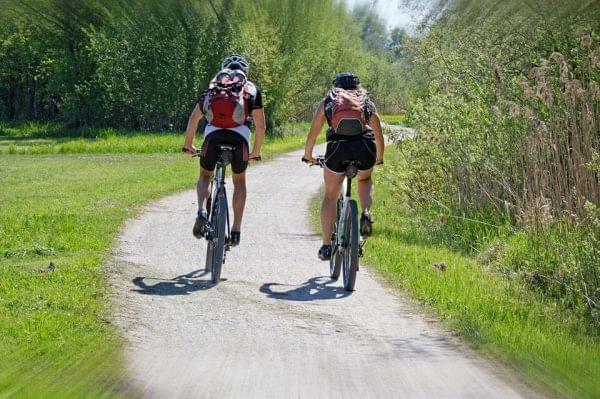 2.- Infrastructure: One of the main reasons why the Camino Frances de Santiago and all its routes are so popular is for the excellent level of infrastructure. From the conditions of the terrain to the availability of shops and supply centres, to the signalling, everything is perfect along it. This is one of the reasons why it is the most popular route among the pilgrims who try this wonderful experience for the first time. 3.- Gastronomy: The Camino de Santiago, and in particular the section from Logroño to Burgos, crosses points that are of special gastronomic interest. 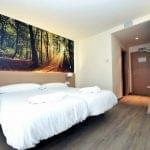 Although we will talk about it later in detail, the cities of Logroño and Burgos offer us a great variety and quality in terms of available choices. This is motive enough in itself to visit the city. The Camino Frances de Santiago from Logroño to Burgos has a total length of 120 kilometres. It is one of the longest stretches of this route and at the same time one of the most beautiful. The stages are distributed in a total of 6 nights and 7 days. In the case of making the bike route, this duration can be halved. Along the way, we will cross many localities with a great cultural, patrimonial and historical interest, such as Nájera and its Gothic cathedral, or the municipality of Santo Domingo de la Calzada. It also includes highly recommended routes through natural environments and well-conditioned for the passage of pilgrims both on foot and by bike. We want to talk now about what are the most reserved options within the offer available on the Camino Frances de Santiago. Besides the section of the Camino de Santiago, from Logroño to Burgos, there are many more alternatives that we encourage you to discover on our website. For the moment, we will talk about the two that have the most success along with the Camino Frances from Logroño. This road route from Saint Jean Pied de Port has a total length of 66 kilometres spread over 5 stages, with its corresponding 4 nights. 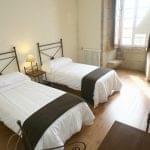 It is one of the most requested and finishes its route in Pamplona after having started in this beautiful French town. 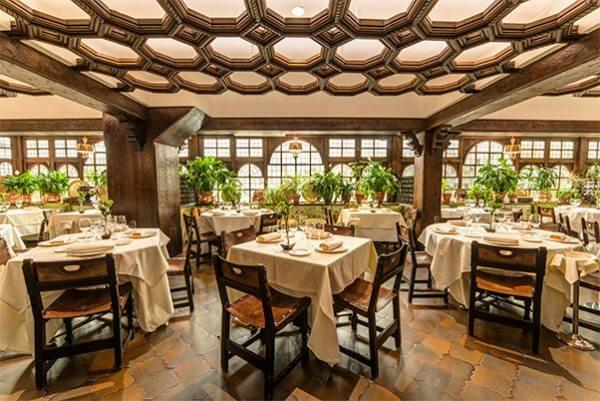 With Santiago Ways, it is possible to reserve it all year round with the option of only breakfast or also breakfast and dinner, and always in the best hotels. The Camino de Santiago from Sarria is the other option most requested by those who are encouraged to live this experience. In this case, it is a route of 111 kilometres, with 7 days and 6 nights of stages. Its popularity lies in the fact that it is the last part of the Camino de Santiago, being already in the autonomous community of Galicia. 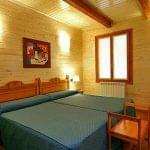 As in all the sections that we offer in Santiago Ways, it is possible to make the Camino Frances from Sarria with breakfast or breakfast and dinner included in the best hotels. To have all the information possible for the Camino de Santiago in the section of Logroño to Burgos, we offer here your maps and itinerary. We want to talk now about the profile of the Camino Frances de Santiago from Logroño. We anticipate that it is one of the easiest sections for those who want to start on the route although it is true that it has some quite steep climbs. In particular, from Logroño to the Alto de Pedraja there is an ascent of 500 metres. From there, the whole route gradually becomes easier as it is in descent, all except the Alto de Atapuerca. We detail all the stages on foot for this route of the Camino de Santiago from Logroño. Stage from Logroño to Nájera. Stage from Nájera to Santo Domingo de la Calzada. Stage from Santo Domingo de la Calzada to Belorado. Stage from Belorado to San Juan Ortega. Stage from San Juan Ortega to Burgos. How long does the Camino de Santiago Frances from Logroño take? The Camino de Santiago from Logroño has a total length of 120 kilometres. It is distributed in 7 stages with its 6 corresponding nights. This time can be halved in the event that the route is completed on a bicycle. You also have to bear in mind that the great beauty of its attractive spots can make us feel like staying more than we had planned by enjoying a view or particular surroundings. We want to break down the different months of the year to tell you what are the advantages and disadvantages of each one. It must be said that, ultimately, it will all depend on each pilgrim's own preferences. However, we want to remind you that with Santiago Ways it is possible to book the Camino Frances de Santiago from Logroño and other options at any time of the year. The month of January has the advantage of leaving us some days off before the end of the Christmas break. That is why this is a time that more and more pilgrims choose to also enjoy the beauty of this festive season along the route of the Camino de Santiago. In February the temperatures go up a little, so the route can become more enjoyable, especially in the coastal areas. We recommend, however, to be aware of the possible precipitations that may fall during this month. In March, spring is definitely approaching in its fullness and the temperature is mild, except in the high-altitude areas. The landscape is dyed in many colours and is a perfect time for nature lovers. 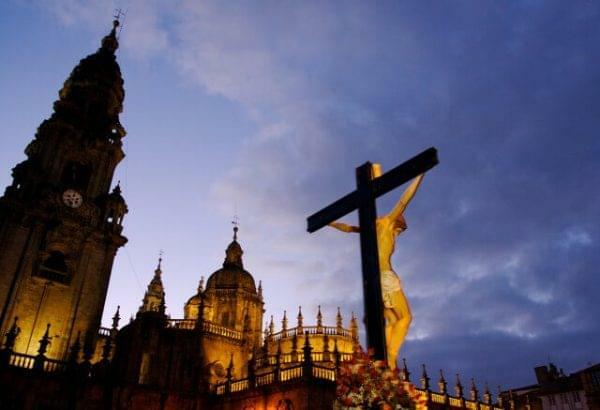 April, as an alternative, is, gaining many followers because during this month Holy Week is celebrated which, on many occasions, leaves us enough free days to be able to make the Camino Frances de Santiago from Logroño. In May, weather instability can be encountered and increase the risk of precipitation. However, it is a month that brings together the best conditions of the spring in terms of temperature. In the month of June, already in the summer, is when many pilgrims are encouraged to enjoy the experience of the Camino de Santiago from Logroño. It is a good time because the holidays start and there are not too many crowds. The main attraction of the month of July is its festivities. 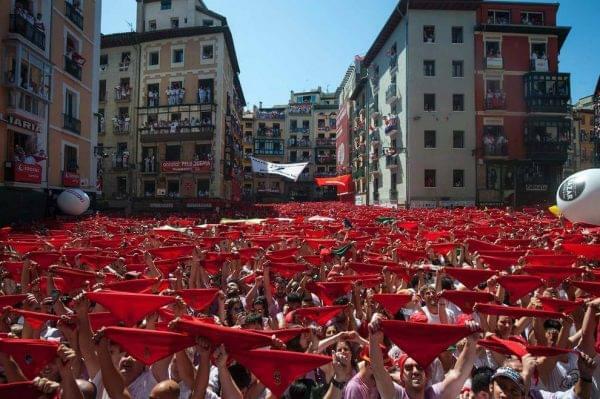 The festivities of Pamplona are from the 6th to the 14th of July and the festivities of Santiago de Compostela between 15th and 31st. That encourages many pilgrims to make the Camino to go to enjoy them if they have already started their route from previous stages. Definitely, August is one of the most popular months. It is because it is the time when people have more free time to go on a pilgrimage. At the same time, in the north of Spain, the temperatures are mild, so it is a good idea to escape the heat to enjoy the freshness of the north. 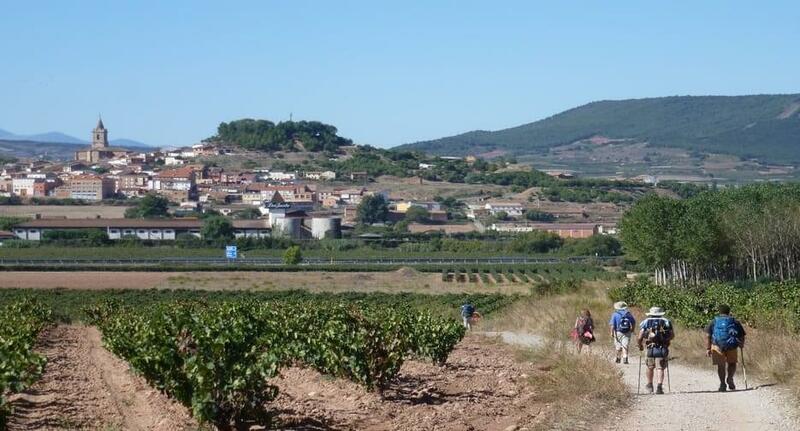 In September the landscape of the Camino Frances from Logroño to Burgos begins to change. It is stained with beautiful colours and is the favourite time for the most romantic. Just like in the previous month, October is one of the favourites for those who appreciate the beauty of the autumn season. However, it is necessary to be prepared for the potential risk of rainfall. In November the ravages of winter begin to be noticed. However, it is also a beautiful time where we can enjoy the beautiful prints that, for example, that are offered by the city and the province of Burgos. There are many pilgrims who make the Camino during this month captured by the beauty of Christmas and the intention to spend these holidays living the incredible experience of the Camino Frances de Santiago from Logroño to Burgos. We have also prepared a selection of the most emblematic places of this route. These include some monuments, some historical sites and, of course, hotels where you can rest and the best restaurants. 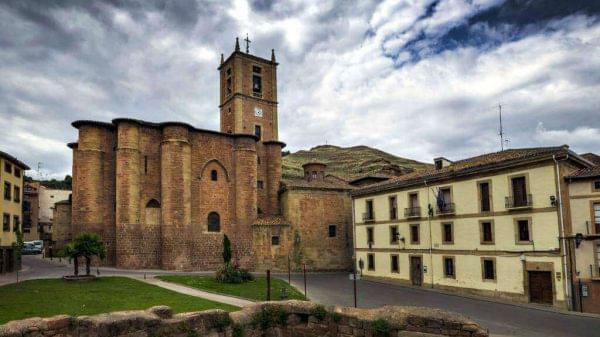 In Nájera, this emblematic town on the Camino, we can find points of great monumental and historical interest like the Monastery of Santa Maria La Real. Also, if you have some time left, we recommend you to visit the caves that are located near this beautiful area of La Rioja. It is another of the most recommended towns on the Camino Frances de Santiago from Logroño. There, we must highlight the beauty of its cathedral, whose predominant style is Renaissance, but also has many Gothic elements. 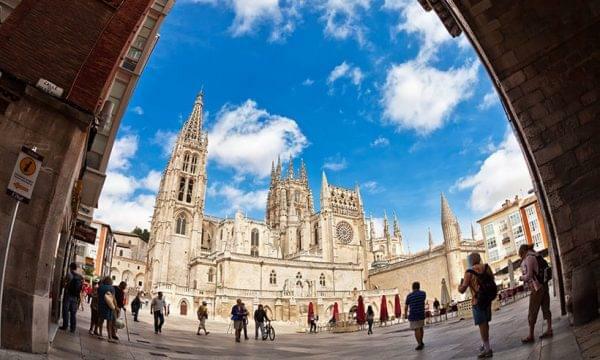 As could not be otherwise, we recommend visiting in its entirety the old part of the city of Burgos. It is a city whose history begins in the Middle Ages. 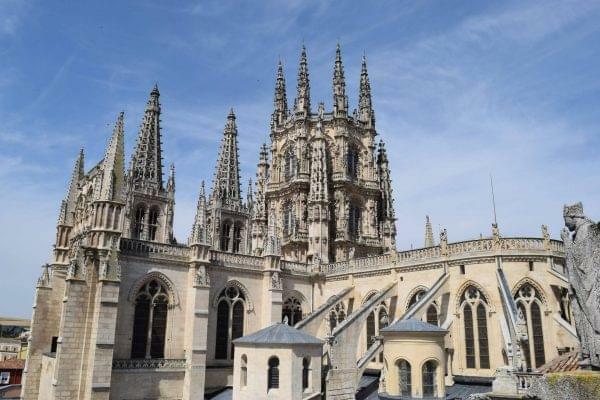 It highlights, above all, is its Gothic-style cathedral, one of the most spectacular in the world. However, you cannot miss the Monasterio de las Huelgas or the Cartuja de Miraflores. We also want to talk about the places where you can stay with Santiago Ways. 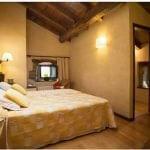 It is a selection of the best possible hotels along the entire Camino Frances from Logroño. Everything, so that you can rest as you deserve. Marisquería La Lonja: It is located in Logroño and, despite being located in the interior, this seafood restaurant can offer us the best products from the sea prepared in the best possible way. Prices are affordable and is a good way to start our journey. La Parrilla Arcaya: In this case, we want to talk about a Barbecue grill that can offer us the best in terms of meat. It is located in the beautiful municipality of Santo Domingo de la Calzada and offers an excellent opportunity to treat ourselves a little on our pilgrimage. Restaurante Casa Ojeda: it is a typical Burgos house where typical regional food is served. Simple cooking with a lot of flavours and, above all, it is very welcoming. You shouldn't miss it as a golden brooch on the Camino Frances to Santiago from Logroño. The origin of the Camino Frances from Logroño dates back to the same time as the Camino Frances. This begins in the Middle Ages and was born as an alternative to the rugged Camino del Norte. This was much more rugged so, as the Reconquista was advancing, it was opening the route of the Camino Frances, a much more practical alternative. Since then, thousands of pilgrims have made their way to Santiago and have contributed to making the Camino Frances from Logroño a route laden with history, magic and charm. Go and experience the route in the best way possible with Santiago Ways. So that you know first-hand what is the opinion of other people who have already made the pilgrimage with Santiago Ways, we offer you a few comments below. We hope that they will help you to encourage you and live this experience with us. Finally, we leave you with some pictures and videos of this part of the Camino. With this, we hope that you can get an idea of everything that awaits you on this magnificent adventure.